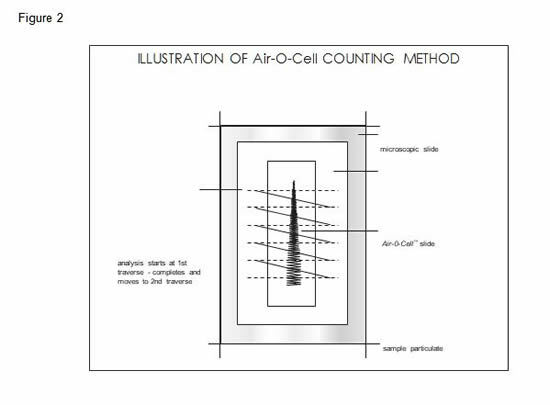 The Air-O-Cell is a unique sampling cassette specifically designed for the rapid collection and quantitative analysis of a wide range of airborne aerosols. It collects both viable and non-viable particulate, such as mold spores, pollen, insect parts, skin cell fragments, fibers (asbestos, fiberglass, cellulose, etc. ), and inorganic particles. Indoor Air Quality: Mold spores, pollen, insect parts, dust mites, skin cell fragments, plant fragments, dust, fibers, combustion emissions, etc. The Air-O-Cell operates on the well-established principle of inertial impaction. Particles in the air stream are accelerated as they approach the tapered inlet opening and drawn through a small slit aimed directly at a glass slide. This glass slide contains a sticky and optically clear sampling media which can permanently collect and hold particles. As the particles come through the slit, the air velocity forces the particles to impact into the sampling media, while the air stream makes a sharp 90 degree turn and proceeds around the slide and out of the cassette. 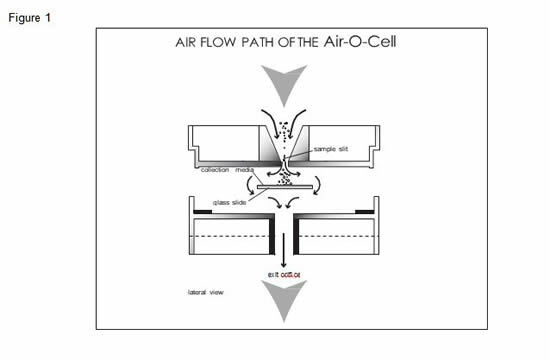 The air flow path through the Air-O-Cell cassette is illustrated in Figure 1. The Air-O-Cell sampler is designed to operate at an optimal flow rate of 15 liters per minute (lpm). The user can employ any sampling pump capable of a minimum flow rate of 15lpm. It is also capable of operating in any vertical or horizontal orientation, or in restricted access spaces smaller than 2 inches in diameter. As a result, the Air-O-Cell is ideally suited for sampling in HVAC ducts, plenums, wall cavities, or other confined spaces. A rotameter calibrated to a primary standard, soap bubble tube/meter or a dry bubble meter, should be used to calibrate the sampling pump to a flow rate of 15lpm. Some pumps only work with specific calibration devices. Please reference the owner's manual for your pump to verify if any special calibration methods should be employed. Because the cassette does not produce significantly measurable back pressure, the rotameter can optionally be connected directly to the pump (without the Air-O-Cell cassette in line) to calibrate the pump flow rate. To begin sampling, remove the tape seals covering the inlet and outlet and place them on the side of the cassette. Then connect the Air-O-Cell cassette to the sampling pump using flexible tubing. Turn the sampling pump on for an appropriate sampling time ranging from 1-10 minutes. Both seals will release after sampling is complete. Unlike spore trap impaction or filter devices, the Air-O-Cell cassette can be oriented in any vertical or horizontal direction, without concern for sample loss of large particles or vibration. "Outdoor background" samples should always be collected for comparison purposes. The Air-O-Cell cassette design allows for isokinetic sampling of aerosols in heating, ventilation, and air conditioning (HVAC) systems. Sampling can be conducted at the supply diffuser or inside most conventional ducts. The inlet of the cassette should always be facing in the flow stream. The inlet orifice has a cross-sectional area of approximately 11mm x 15mm tapering to a slit with dimensions of 1.055mm x 14.4mm. The flow velocity can be increased up to 30lpm with conventional sampling pumps, however, air flows exceeding 20lpm may potentially damage some bioaerosols or cause "bounce off". Isokinetic sampling can be conducted in most air duct systems with flow rates of up to approximately 600fpm. Approximate face velocities for the Air-O-Cell cassette are given below for both the entrance orifice and slit exit in the table below. Although the Air-O-Cell cassette can provide excellent detection limits over conventional filter sampling utilizing 25mm or 37mm diameter filter cassettes, it is also sensitive to overloading. In an appropriately loaded sample, the trace should be barely visible and transparent, but not opaque or dense. If the sample appears highly visible or opaque, additional shorter time interval samples should be collected. The recommended sampling flow rate is 15 liters per minute (lpm). As mentioned above, flow rates exceeding 20lpm have been known to cause "bounce off" of large particles, such as pollen grains. Flow rates lower than 10lpm will not collect the small mold spores, such as Aspergillus and Penicillin, as efficiently. Recommended sampling times (at 15lpm) for different environmental sampling conditions are given in the next table. "Clean" office environment or outdoors (no visible dust) 10.0 min. "Indoor" environment, high activity personnel 5.0 min. "Indoor" environment, evidence of drywall renovation, or industrial dust 1.0 min. "Indoor" environment, visible dust emissions from point sources present 0.5 min. One to two (1-2) drops of staining or mounting medium should be placed in the center of a clean pre-labeled slide. Air-O-Cell cassettes should only be opened in the laboratory. The sealing band should be cut, and the glass cover slip removed and slowly placed on an angle with the media collection side down onto the staining solution. Do not press down on the slide during or after staining. Excess staining solution should be removed from around the edges of the coverslip with a tissue wipe or cotton swab after 10 minutes have elapsed. This will ensure even staining of the sample. It should be noted that the slide can also optionally be mounted media side up. To do this, use a drop of fingernail polish to secure the Air-O-Cell slide to the microscope slide. Then place a couple drops of stain on the media and place a cover slip on top. Numerous stains may be used during laboratory analysis. These include lacto-phenol cotton blue, aniline blue, calbreras stain and acid fusion stain. The most common stain used for mold spore analysis is lacto-phenol cotton blue. To achieve the best clarity of the sample, using stains that have little or no water content is preferred. Water can cause the sample to appear cloudy. Analysis of the collected sample should be performed by an experienced Microbiologist, Aerobiologist, Mycologist, or Envrionmental Microscopist. Counting and quantification of sample components is conducted by counting calibrated cross-sections of the deposited sample trace. The number and type of particles counted per cubic meter of air is calculated based on the length of the deposition trace, length of trace actually examined, volume of air collected, and number of particles counted. The Air-O-Cell particle deposition area at a flow rate of 15lpm is approximately 1.1mm wide by 14.5mm long, yielding an approximate area of 15.95mm2. The width of the deposition trace will vary slightly with flow rate and media thickness, and will vary slightly in particle density from the middle to outer edges of deposition. For this reason, using the deposition trace area is not recommended for direct calculation of particle concentrations. The recommended procedure for calculating particle concentrations is based on using the Air-O-Cell trace length and microscope field diameter, and will be discussed below. One field of view counted is defined as the calibrated diameter of the microscope field of view (in mm) covering one cross-sectional pass or "traverse" across the sample deposition trace. A typical sample preparation and microscopic counting procedure is illustrated in Figure 2. The calculation of particle concentration per cubic meter of air can be performed by using the following equations. First, determine the actual air volume collected in cubic meters by following the calculation given in Equation 1. Second, determine the length of sample trace counted based on the microscope field of view and number of fields of view counted. Accurately calibrate and measure the diameter of the microscope field of view using a stage micrometer slide. Remember, each microscope is different, and each different combination of ocular and objective lens must be calibrated separately. Stated lens magnifications are rarely precise. The microscopist should then record the number of complete traverses examined across the width of the deposition trace and use the formula given in Equation 2 to calculate the actual length of the deposition trace examined. The concentrations of particles (cts/m3) can then be determined by using Equation 3. Two example calculations for mold spores and pollen grains are given below. Pollen: Entire trace or 100 grains (whichever comes first) should be examined at a minimum magnification of 200X. Identification and speciation should be performed at a minimum magnification of 400X. Mold Spores: A minimum of 15% of the entire trace should be examined or a minimum of 100 mold spores counted (whichever comes first). Identification and speciation should be performed at minimum magnification of 400X. Fibers: The entire trace or 100 fibers (whichever comes first) should be examined at a minimum magnification of 200X. Other Aerosols: Skin cell fragments, combustion emissions, insect parts – A minimum of 10% of the entire trace should be examined or a minimum of 100 particles counted (whichever comes first). This product should be stored at room temperature between 60-82°F (15-28°C). Do not use product at temperatures below 32°F (0°C). If product has been exposed to freezing temperatures immediately before sampling, it is recommended to let the product acclimate to the sampling environment before use.